The Blond Ambition was first planned to only visit Japan and North America because Madonna was busy with several movie roles. But considering her popularity in Europe, another tour leg was added. 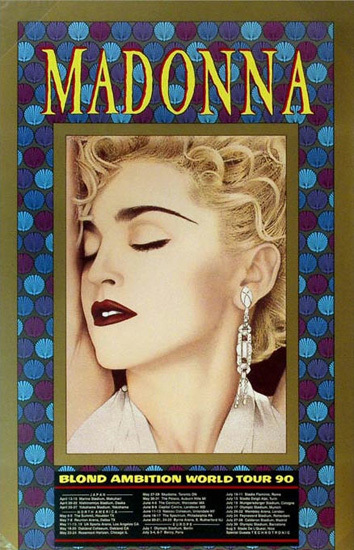 Kicking off in Makuhari, Japan, Madonna played a total of 57 shows in 10 different countries. Originally titled the Like A Prayer World Tour, this tour promoted her latest studio albums Like A Prayer and I'm Breathless. The Blond Ambition Tour was a much bigger production than her previous two tours, which meant a more extended crew. Madonna was joined on stage by backing singers Niki and Donna, as well as 7 dancers, who we all got to know better in the tour documentary Truth Or Dare. Several Blond Ambition shows were filmed. The recording from Nice was commercially released on Laserdisc, titled 'Blond Ambition World Tour Live'. The release won a Grammy Award for Best Long Form Music Video. Unfortunately it was never converted to DVD format. The best quality footage we now have are the performances that are included in the documentary Truth Or Dare / In Bed With Madonna.